As the world is shaped a bit smaller by various technologies and opportunities, nearly everyone finds themselves working or living next to people they do not understand or even like. There are so very many cultures, beliefs, attitudes, mindsets, and ways of doing things that it’s impossible to keep straight. People are people, however, but cultures are cultures. Generally, any given person will react about the same way, within bounds, to any given stimulus. But since all of us come from different cultures, it’s often very hard to know just what someone is thinking as we don’t know how they have learned over time to think about what is important, what is moral, or what they own. Certainly, among all these cultures, one must be “The Best,” yes? No. Not at all. They cannot be compared that way and they are never any kind of marker for genetic or intellectual superiority. They are nothing more than a series of observations which became habits which were in turn codified. To miss this is to miss the richness of the world, and to simply accept it is to miss the importance of intuition and intellect working together which defines our species. 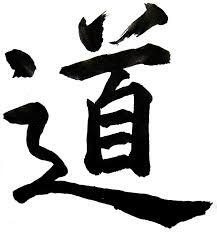 Tao, or Way, as a Hanzi character. Some 8,000 years ago, according to recent finds, people settled on the banks of the Yangtze River. The climate was nearly perfect for our species and provided a rich, stable source of food. The people who came there settled down and routinely had great big meals, keeping them happy. At night they probably talked and thought through the mysteries of the universe. Within 4,000 years they were developing a body of written knowledge on how to do many things. They valued peace, harmony, and clear thinking. It’s what their paradise allowed. On the banks of the Tiber, life was also pretty good 4,000 years ago. It wasn’t as great just a short distance away, and invaders came in from the Black Sea and settled in to this better place. They made it theirs. They were always wary of people from worse places who sometimes developed raiding parties for organized stealing. As good as life was, they had to be constantly on their toes. They also developed a rich body of knowledge but were very much a warrior people. Some 2,000 years ago they spread out and claimed other good places around them. Along the Mississippi, life was much harder. The world provided a good life, yes, but the weather was terrible. Survival was guaranteed for any group that could keep moving to the next trove of riches, but settling down was not viable. The people who lived there developed a great respect for nature because they had to be able to read the skies and the herds and the other signs which pointed to enough to survive on this rich but harsh continent. Warfare was generally not to their benefit, but they stayed on their toes as well. These are just three examples of people in the world who developed civilizations. In each case, their development had much more to do with the environment that they lived in than anything else. In time they grew to look very different from each other, but these differences were not the main force keeping them alive. Evolution works much slower than the rise of civilization. The main difference between each of these people was that they passed on knowledge about the universe, morality, organization, and most importantly how to survive where they were. An experiment in this process was conducted between 100 and 500 years ago, a time much shorter than any evolutionary changes. People from the first two cultures came to the third, armed with various new technologies and habits which they acquired. They thrived, much to the detriment of the people who lived there. But they also took on many of the same attitudes, modified for a technology driven settled life. They learned to keep moving, looking for new opportunities where they could. They also brutally tamed the harsh landscape in other places. They broke from many of their old ways and embraced the openness of the new continent. It would be years before they would learn that their genetic differences were so minor that they are biologically meaningless, so they developed codes to describe each other based on superficial difference. These included skin color, eye shape, and language. They were still the same people matching patterns and codifying observations into habits and cultures, but the world they were responding to was now entirely man-made and new. After a time, the world became smaller yet and everyone from climates and situations all over the world started bumping up against each other. Some were from harsh desert regions where every moment of every day was codified, a good survival strategy. Some came from tropical rainforest areas where life was good for those who were constantly wary and lived well in the moment. All of them had different ways of looking at the world, and all of them changed as their world changed. How quickly do they change? It depends a lot on many things. Some people, as people, resist change as they tend to think more about survival and staying safe. Some people want opportunity more than anything and change more quickly. Throughout life, everyone moves from an attitude of thriving and moving forward to one of surviving and protecting their families, fortunes, and friends. All of the attitudes that people have, however, are what they came to understand in their formative years as they first opened their eyes to the world and their mommas and daddies explained to them what they were seeing. Some of it was realized in the guts and made its way to the head, some went the other way. All of it joined into a network. And all of it is fascinating. Not for the superficial markers like body shape or language, but for the depth of experience codified over thousands of years. Much of it is valuable ancient learning carried so deeply it feels as if it is in our bones, but it is not. We are still largely the same people, everywhere, without time to evolve into anything too different. The only the different between any of us and our ancestors from thousands of years ago is what has been written down since that time. But what we all wrote down or passed on orally was different for very good reasons. Learning those reasons is fascinating and rich, and as good of a source of true wisdom as time spent after a good meal imagining and talking. This is what I call the General Theory of Climate and Culture. It states that what makes us different is the environment we came from and how we learned to respond to it, and little more sophisticated than that. And yet it is rich and wise and powerful all the same, once you get beyond the superficial and really get to know what has brought our species to where we are now. This entry was posted in People & Culture and tagged climate, Culture, people. Bookmark the permalink.